A man who died in a Shetland house fire has been named. 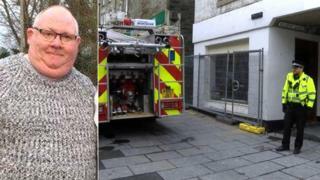 Ross Grant, 48, died after the fire broke out in Burns Lane in Lerwick on Sunday 24 February. Four fire engines attended - two from Lerwick, one from Sandwick and one from Bixter - after it broke out in the two-storey building. There did not appear to be any suspicious circumstances. Police earlier thanked "brave" members of the public who tried to save Mr Grant.